If you’re interested in shooting high quality video using a DSLR or mirrorless camera you, my friend, are in luck: the world is your oyster. But with so many choices it can be hard to decide which camera to buy. After shooting video for a living since 2006 here’s my picks for the top 5 best DSLR and mirrorless cameras if you’re planning to do the same, or even as a fun, rewarding hobby (scroll down to cut to the chase). Over the last few years the market has seen major advances when it comes to video. Now there are several (relatively) low cost cameras that can shoot high resolution formats such as 4K, record well in low light with minimal noise, and, even, track a moving subject thanks to accurate, continuous auto-focus (a feature previously only available on camcorders, and not DSLR cameras). I rank the Canon EOS 70D #1 for a reason: it’s a quality workhorse that has never failed me. The video quality is excellent. And, because it uses the ubiquitous Canon EF lens mount, there’s a barnyard of lens options. Price-wise, it’s a bargain. You needn’t spend thousands for a full-frame camera to get film-like footage. Put quality glass on it, such as the remarkable Sigma 18-35mm ART lens, and prepare to be blown away by the results. Yes, I love this camera (as I did its successor the 60D). One key feature of the 70D that might make it ideal for you versus my other picks below is its trick auto-focus. Canon calls it Dual Pixel CMOS Auto-Focus. This handy features allows you to use the touchscreen to mark a subject – from there the 70D will automatically track it wherever it moves. It works extremely well. Note that to get best results you should use one of Canon’s new “STM” lenses. I have the Canon 18-135mm STM kit lens on my 70D about 90% of the time and it can get me close-ups, decent wide shots, and with stabilization I can get acceptable handheld work too. The Sony Alpha a7S took the market by storm last year. And for good reason. Sony’s powerhouse performer comes in a tiny package, but offers stunning, cinematic performance. Plus, the a7S may well be one of the best low-light cameras of all times. Check out some of the reviews and you might be stunned to learn that this camera can literally see in the dark. That alone might make it the perfect choice for you, especially if you shoot videos, say, at night, or in dark theaters, or at dimly lit weddings and receptions. Feel free to crank ISO on the a7S — you may be surprised at how much light you can add to a dark scene without introducing noise (the same can’t not be said, sadly, of the 70D above). Also, important to note about the a7S is that this is a “full-frame” camera. This essentially means the sensor captures images in identical size to a traditional 35mm camera. So, a 50mm lens captures images at 50mm. Contrast that to a “crop sensor” such as the aforementioned 70D (APS-C) that will capture an image zoomed in or “cropped” — in the case of the 70D the image is magnified by about 1.6, hence using a 50mm lens results in a images equivalent to 80mm. I’m over-simplifying here, but hopefully you get the idea (Google for more in-depth information on the subject of full-frame vs. crop sensors to learn more). One gotcha with the a7S: “Jello”. Or, also known as “rolling shutter.” That means, simply, if you do fast pans, say from left to right, the image will get warped and distorted, prompting many to refer to the footage as Jello. So, heads up, if you do a lot of action work, be it sports or dynamic street videography the a7S may not be for you. Sony priced the a7S very competitively. Retailing for $2,499 you might think otherwise, but keep in mind its nearest competitor is likely the Canon 5D Mark III, another full-frame camera, yet priced about $1,000 more (Canon has since dropped the price of the 5D Mark III). If I were just getting started in video, and wanted a high performance camera, and had yet to invest in Canon EF lenses, I might very well make the Sony a7S my first choice for best overall video camera. It is, in a word, phenomenal. Another relatively new camera that has upended the <$3K market segment for DSLRs and video cameras. The big headline with the Panasonic Lumix GH4 is: internal 4K recording. 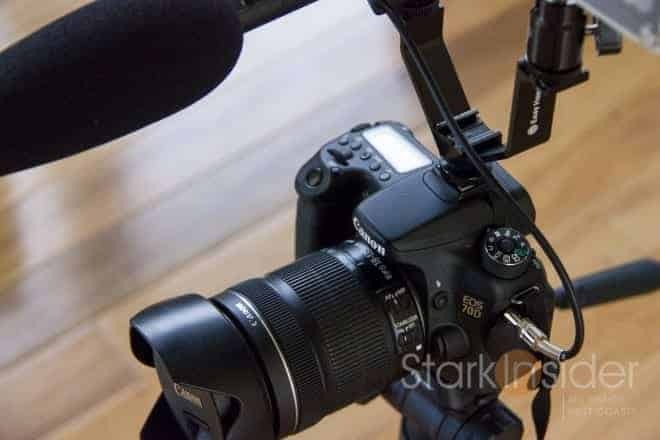 You can record to 4K without the need for an external recorder (as the a7S, above, requires). That’s pretty impressive. Really impressive. Whether or not you actually need 4K capability today is of much debate. Sooner or later, though, it will become the standard. No question, just a matter of time — when, in the history of video, have we ever not moved to higher resolutions?! Like the a7S the GH4 is mirrorless. Because no mirror is used, the overall camera is compact compared to something such as–my sweetheart–the Canon EOS 70D. Lenses for mirrorless cameras such as the GH4 and a7S also tend to be quite small by comparison. So if portability matters to you that’s something to keep in mind. Many camera sites and enthusiasts compare the a7S to the GH4 — both hit the market about the same time, are fairly close in price, and offer high performance mirrorless camera bodies. Comparing the two could be as simple as this: want low-light performance go with the Sony a7S, want internal 4K go with the GH4. Of course, in reality your decision will likely be based on many more factors. My advice: don’t sweat it too much… buy one already, and start shooting, and shooting and shooting! Both will produce amazing footage. Get your gear, then shift your mental cycles to more important things: capturing high quality sound, telling a compelling story, framing your shots creatively, etc.